Even if you have had statistical training, and you already know, for example, that “average” could mean “mean”, “median”, or “mode”, this accessible will raise your awareness of the slipperiness of “facts”. The style of the illustrations and some of the historical and cultural phenomena and prominent personages mentioned in the text as well as the economic data give the book a pleasantly old-timey feel, like 125 Ways to Make Money with Your Typewriter, though not to the same extent. After reading three books about visual displays of data, I thought I’d read a related book about data. Graphic Discovery sounded more interesting in the table of contents, preface, and introduction than it actually was. Caveat emptor. Specific gripes about the book are listed below. Musicophilia is a collection of neurological anecdotes all dealing with music. It never ceases to amaze me how much we can learn a lot about brains from by studying those with damaged or otherwise unusual ones, and I’m very grateful that Oliver Sacks not only dedicated so much of his own ample brainpower to that very task, but also chose to transform his professional experience into reasonably accessible stories for non-experts. Not being anything like as musical as Dr. Sacks, however, I found it a bit difficult to relate to him as a narrator of tales specifically about music. Sometimes he used the word “music” to refer to “serious Western classical music” in a way that seemed to indicate that pop songs obviously didn’t count. I think I would have felt the book was several degrees more approachable if he had started out with some acknowledgement of the wide variety of music in the world, and then explicitly characterized some of it as being more cognitively challenging or worthwhile to produce and consume, and therefore more relevant to many of his case studies and much of his discussion of them, rather than leaving such things implied but largely unsaid. All in all, not one of the better Oliver Sacks books, but still, like all eight of the other Oliver Sacks books I’ve read so far, undoubtedly worth reading. Whatever Oliver Sacks writes about, he approaches it in an educated, thoughtful way. With footnotes. I especially enjoy reading what he has to say about brains. The Back of the Napkin was disappointing, perhaps because I’m not in the target audience. As far as I can tell, the target audience is people who work in a consulting firm or a big corporate environment, don’t like drawing, and don’t know what a Venn diagram is. In the service of better business meetings, the book brings together basic visual displays, superficial insights from cognitive science, and the five w’s of journalism, wrapping it all in a nicely designed but gimmicky napkin-shaped book printed in black and red. The author sets out some good principles and good examples, but at the end of the day, I just felt like he was showing off the successes of his own career; none of it seemed particularly likely to help me, and somehow it didn’t make for compelling reading. Bought it in Atlanta in 2014. It’s been waiting its turn long enough. Kings of Pastry offers a glimpse into the lives of those aspiring to the highly respected designation “Meilleurs Ouvriers de France (MOF)”, awarded in France to the world’s top pastry chefs. Although there were some aspects of the documentary I found interesting or dramatic, I didn’t think it was particularly good overall. I think I’ve been to the Paradise Dynasty restaurant at Ion twice now. I really like the decoration, which you can sort of see here on the restaurant’s website. So many restaurants in Singapore seem temporarily perched in some unit in some shopping mall; the lease expires, the rent goes up, the restaurant dies or moves somewhere else. So although every shop and restaurant does some interior decoration for branding purposes, the environment often feels like a cardboard set, too superficial for comfort. You eat there, and the food is fine, but you feel like the experience is just a flash in the pan. Not so with Paradise Dynasty. Even though the color-changing LEDs behind the curtains serve as a constant reminder that you’re in one of the countless flashy shopping malls built within the last decade, the plush red chairs, dramatic lighting, wood screens, and stone floors make the place feel older and more authentic. 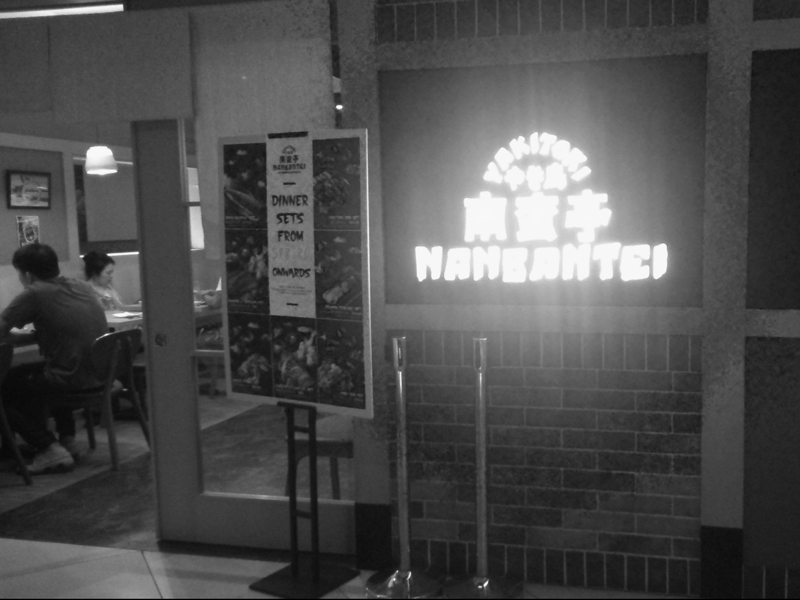 I recently learned that Nanbantei, my favorite Japanese restaurant in Singapore, has a new outlet at Chinatown Point. Even if I were already in Chinatown, though, I would probably go to the Nanbantei at Far East Plaza. I don’t know how long it’s been there, but it’s all wood and brick and cozy inside, whereas this just looks like every other Japanese restaurant, more or less, and I know it hasn’t been there long at all. I’m pretty sure the unit used to be occupied by a French roast chicken restaurant called Poulet. Like I said, high real estate prices make every business vulnerable to rent fluctuations. Poulet’s Westgate outlet has also closed down, and not long ago when I went to the Japanese restaurant I liked at Westgate, it was only after sitting down and ordering that I realized that the place had been converted into some other Japanese restaurant. My husband’s favorite Japanese restaurant (Aoki) is now undergoing renovation, and his second-favorite Japanese restaurant (Chako) closed permanently just before the building (Hong Leong Garden) was knocked down and replaced with a newer one (NEWest). The closure (in 2013) of the authentic Swiss/German fondue restaurant Stammtisch at Sixth Avenue might qualify as the worst of them. I wish I knew of more great restaurants that feel like they’ve been here forever and will outlast even me, but things just keep changing. Whatever it is you like, enjoy it while it lasts; blink and it’s gone. Kindly dispose sanitary pads in the sanitary bins provided. Please do not throw them into the toilet bowl as it will choke the sewage sewerage. Thank you for your co-operation. There are several things I’d like to point out about the sign, including the use of ‘dispose’. See below for details. Logan was bloody, morbid, and sad. There were some darkly funny and grimly satisfying moments, but in general I’m not a fan of the trendy “decrepit superhero” trope, which is what governs the entirety of this 137-minute film, a gritty, R-rated, sci-fi/western production marking the end of the seventeen-year era in which Hugh Jackman has played Wolverine. I was impressed by the female star’s Hugo Weaving-like frowny face, which she used for almost the entire movie, and the character (portrayed by a digital collage of the actress, her stunt-double, and a laboriously created CGI avatar) seemed pretty capable. It’s hard to call the movie a triumph for her, though I would have liked to. For one thing, the tone of the movie is hardly triumphant, and for another thing, the movie isn’t about her, or even about her relationship with Logan, it’s about Logan. (It says so right there in the title!) So although she drives the plot, and one or two of the cars in the plot, unquestionably, she’s still second fiddle. Jiro Dreams of Sushi is an amusing, eye-opening, and well-produced documentary about an exacting Japanese sushi chef named Jiro Ono, whose dedication to his craft is remarkable as much for its relentless lifelong perfectionism as for its world-famous success. What I least liked about it was seeing dead or soon-to-be-dead sea creatures being inspected, bought and sold. Visually, what I liked best was seeing each individual piece of sushi placed on a lacquered, rectangular dish on the softly-lit counter top, where gravity briefly, subtly altered its shape in a kind of slow, glistening ooze. The strongest impression I’m left with, though, is Jiro’s seemingly unflagging sense of purpose: to make the most exquisite sushi he possibly can. Nothing else seems to matter in the slightest.